You’re predicting miserable days ahead because your plantar fasciitis is causing you severe pain. You’ve reached a point here you can do anything to take away the suffering and have happier days like you used to before this monster came into your life. Lucky for you, plantar fasciitis taping is one of the easiest methods of treatment for this foot condition. It helps calm down the pain and inflammations disturbing your peace. And you can do it without the aid of a professional. What is Plantar Fasciitis Taping? As I’ve told you earlier, plantar fasciitis taping is a way of taping your injured foot such that you get immediate relief. To get on with this treatment, you’ll need to use an athletic or the kinesiology tape. And when done the right way (I’ll teach you this later in this post), it adds support and reduces the stress on your plantar fascia ligament. In addition to relieving the symptoms of plantar fasciitis, taping also acts as a preventive measure against plantar fasciitis and other conditions that cause heel pain. The popularity of taping can’t be ignored especially by the athletes who always tape their feet to limit the stretching done by the fascia so that it suffers no tears. Now you have an idea what taping is all about. This means that you qualify to enter the next stage, which involves learning how to tape your feet and reduce pain and inflammations. You should not leave the taping on your foot all day. Why? 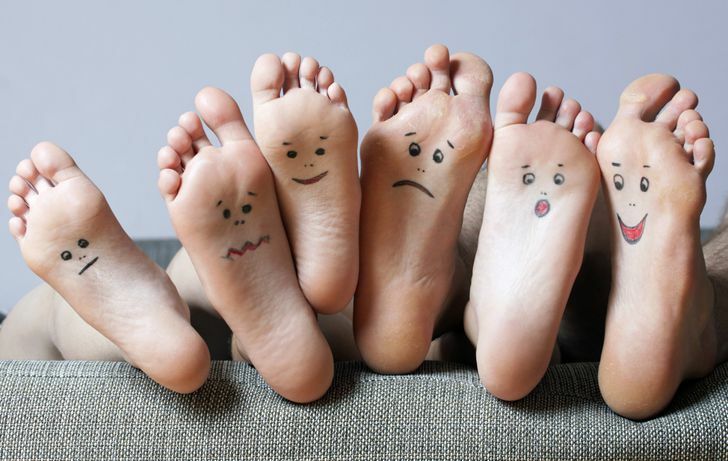 Your foot needs enough time to breathe- this will ensure that your overall body health remains good. Thoroughly clean and dry the area you wish to apply taping on to help the tape adhere to your skin easily (if possible, use a non-moisturizing soap to clean). And, of course, you’ll need 1 to 2 inches of the regular athletic or the kinesiology tape. Cut two- 1-inch strips of your tape. Also, get another 4 to 6 pieces that are slightly wider. Next, place the one-inch pieces on the outside of your feet (do this from behind your small to the back of your heel, then to your big toe), making a semi-circle on the outside of your foot as well. Place the wider strip at the bottom of the 1-inch piece. Do this across the bottom of your foot, and end it on the other end of the 1-inc strip. Remember to pull the tape snug for the best support. Now overlap the tape (half an inch), on each side of your foot. Place the strips all the way across the bottom of the feet until you finish behind your feet balls. With all the strips at the bottom of your feet, put another 1-inch tape strip such that it starts right behind the small toe, goes all the way around your foot, and ends up right behind the big toe (much like the first tape piece you started with). Do you pronate? If yes, this taping technique will be a great deal to you. This is based on the fact that this method supports your ankles and feet as well as reducing the range of motion of your feet. Also, low dye taping adds support to your plantar fascia ligament helping it heal faster and relieve pain. This is probably the most supportive taping method for plantar fasciitis, yet it’s also the most complicated. Run a strip that measures 1-ich long from the bottom of the big toe and end it right behind the pinkie toe (similar to what you did at the start of longitudinal taping technique). Next, put a piece of tape from the bottom of your big toe and end it at the bottom of your pinkie toe (which is across your foot bottom). Take another tape strip and run it from the bottom of the big toe, all round the foot, and then back to the pinkie toe base. Take another strip and put from just behind your pinkie toe, around the heel, and finish juts behind your big toe. Then, from the bottom of the pinkie toe, make a big X across your foot bottom. Repeat the same thing for the side right behind the big toe. The final step involves taping the foot by placing a strip across the bottom horizontally until your entire foot is covered. When moving through your gait, your arch might collapse if it lacks enough support. The result of this is that more strain will be put on your fascia and cause micro-tears. Arch Brace taping, therefore, involves taping your arch to add stability to your foot. This way, it absorbs shock more efficiently. Oh! Did I tell you that this is the simplest taping method for plantar fasciitis? Make sure the entire arch is covered so that your brace will be useful from the word go. Wrap the tape around the middle of your foot (i.e., in the arch to create a brace). Two type of tapes are available for taping your foot for plantar fasciitis. Kinesiology tape, however, should be your number one choice, especially if you plan to be active. Unlike the regular athletics tape, kinesiology tape adequately supports fascia in addition to lifting your skin gently to create room for blood circulation and reduce inflammations. You can find the Kinesio tape at your local sports store. As you continue taping your feet, take the time to smooth out the entire taping. That is, ensure that your tape has no wrinkles as it might be less efficient in addition to making you feel uncomfortable. Don’t make the taping too tight on your toes. Ensure that you can wiggle them and that blood circulation isn’t cut off to any part of the foot. If you notice your toes turning blue, it’s a clear indication that you taped too tight, and you should cut it off ASAP! Since taping is one of the many methods of alleviating inflammations and pain associated with plantar fasciitis, you can use it alongside other remedies/treatments for the injury e.g. rest, icing, non-steroidal medications. Lastly, do NOT leave the taping on your foot all day. Give your skin sufficient time to breath if you care about your overall body health. Does Plantar Fasciitis Really Work? Yes, it works. 100% guaranteed. But it’s important to note that the success of this method of treating plantar fasciitis tends to vary depending on individual as well as the severity of their plantar fasciitis condition. Depending on the above tow conditions, taping might not yield any results in an attempt to reduce pain. In other cases, it might decrease the symptoms of the foot disorder. In some situations, it will treat the condition thoroughly. First, always use this method to help prevent your plantar fascia ligament from being overly stretched when engaging yourself in any physical exercise, e.g. running. This is the surest way to keep off any future occurrences of plantar fasciitis. For those who’re suffering from plantar fasciitis, taping would be the most efficient form of treatment when used alongside other therapies/remedies that are intended to not only relieve pain and swelling but are also effective in repairing this condition. Plantar fasciitis taping is the simplest form of treatment that has been developed to help treat this foot condition. It does not require any professional assistance and is also quite affordable. When done the right way, it helps relieve unnecessary stress on your fascia. This ultimately reduces the inflammations and pain associated with plantar fasciitis. Taping also aids in healing your injured plantar fascia tendon. With all the taping testimonials available, there’s no doubt that you can bring an end to your misery with this simple plantar fasciitis treatment.